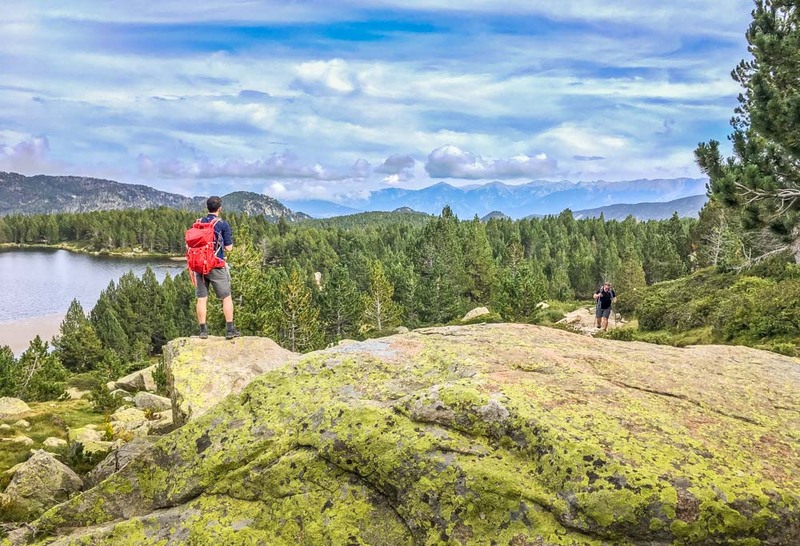 La Cerdanya is a playground for all those who love the great outdoors. 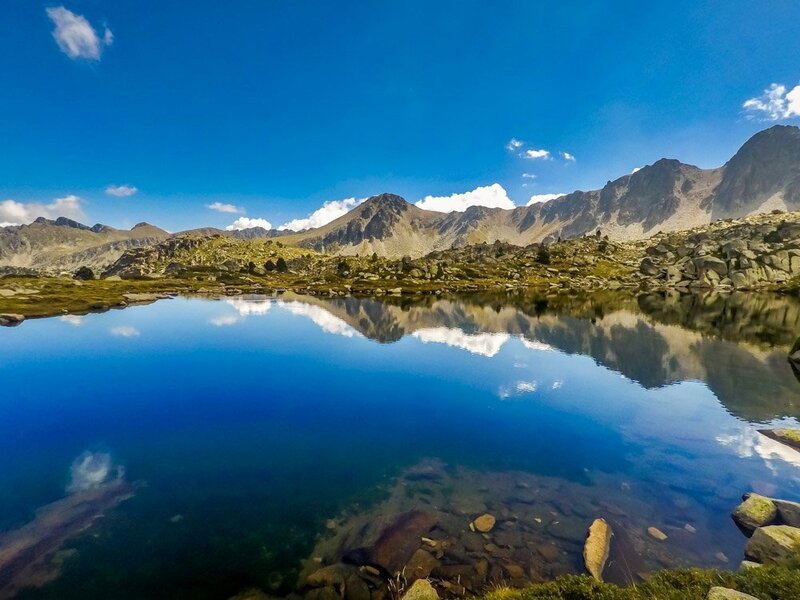 Rugged mountains, sparkling glacial lakes, and verdant valleys set the scene for hikers, climbers, cyclists, mountain bikers and those that just enjoy ambling about in beautiful surroundings and we discovered much of what the area has to offer on a recent trip there. 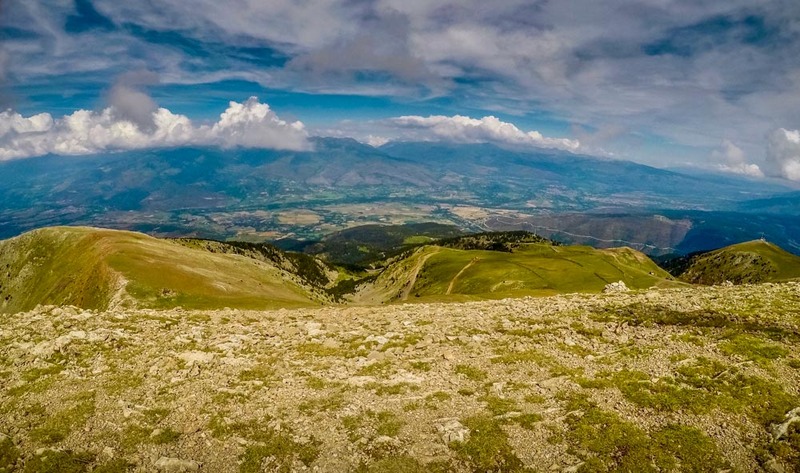 Cerdanya is an area of northern Catalunya which also creeps into France and is within striking distance of Andorra. 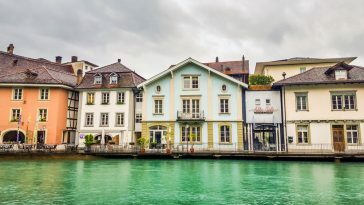 Our base for the week was Puigcerdà, the mountain town and capital of the region, which is a short 2-hour drive from Barcelona via some captivating Catalan countryside. Puigcerdà holds a great position at the head of the vast Cerdanya valley and the surroundings are spectacular. The long and flat valley, which looks so atmospheric when filled with early morning mist, is surrounded by high mountains. 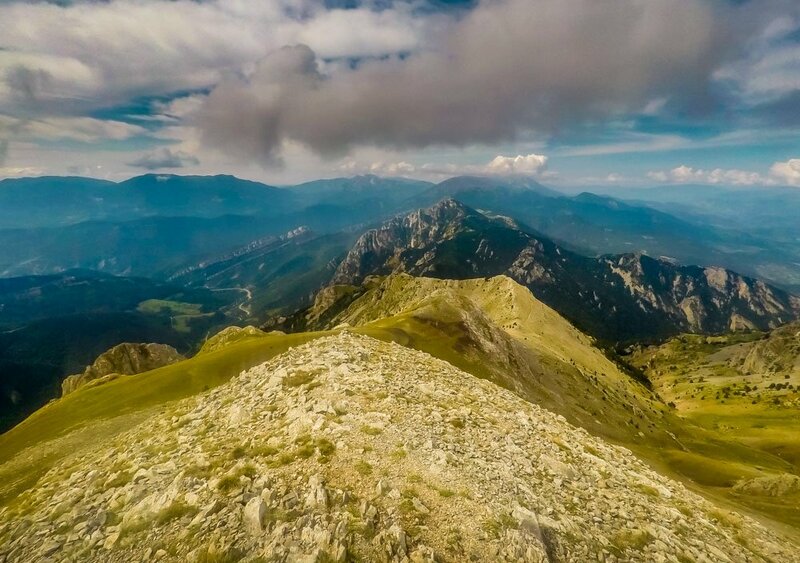 To the north are the Pyrenees, to the south are the limestone faces of the Serra del Cadí and the Cadí-Moixeró Natural Park which is contained within the range. We eased our way into our walking week with a trip to the ski resort of La Molina which also serves as a mountain bike park in the summer. The main draw for us was the ski lift that whisked us up to 2,300 meters – there would be plenty of time for uphill exertion during the week so there was no need to overdo it on day one. We ambled up to the 2,500-metre peak of La Tosa which gave us a great vantage point for surveying the region and getting our bearings for the week ahead. I soaked up the scenery and took a mental note of the geography of the landscape that we would be exploring. My walking companions took impolite photos of my ponderings and assured themselves that if I had visualised their walking week for them, then it allowed them to focus on their own obstacles such as how to walk all day with the occasional hangover. Teamwork makes the hiking week dream work. The views up there were stunning; the Serra del Cadí stretched out to the west with the famous two-pronged Catalan mountain of Pedraforca slightly to the south of the ridge. Mountains rolled into hills all the way back to Barcelona and Montserrat could be seen in the far distance. To the north was the Cerdanya valley and above that the Andorran, Catalan, and French Pyrenees. A view to make a mountain lover happy. Legs broken in we headed back to the ski lift which gave us the chance to survey the mountain bike routes and the cyclists that were flying down them. There are 13 different graded routes here with something for all levels. Well, almost all levels. If we had hurtled down the tracks at the same speed as the bikers we were watching, then the only outcome would have been a trip to the spinal clinic. We had walking to do so we wisely put off mountain biking until later in the week. 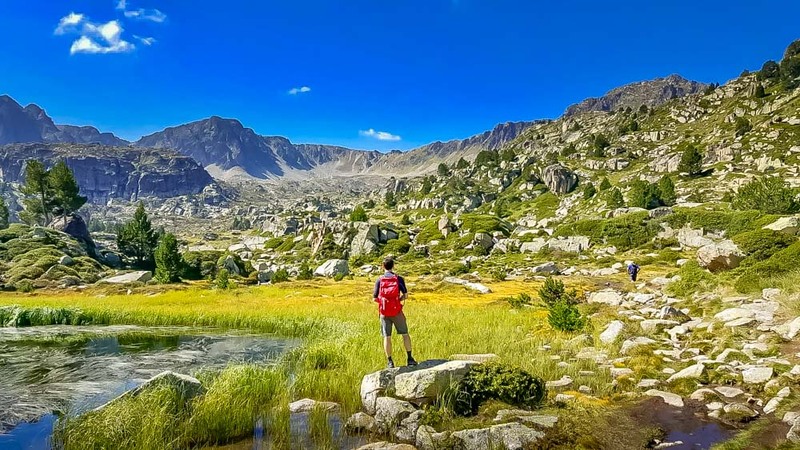 For our second walk we headed into French Cerdagne and the Pyrénées-Orientales on a winding road that took us high up through beautiful forests and idyllic camping areas, before arriving at the parking spots by the huge Lac de Bouillouses. There is a refuge, hotel and restaurant here which would be welcome safe havens in inclement conditions, but it was shorts and t-shirt weather as we set of on a tour of the lakes of the Carlit massif. There is something very heartening about starting a walk at 2,000 metres in altitude, mainly because it caps the height that you will have to subsequently trudge up, unless you make the terrible mistake of picking a route that inexplicably plunges downhill first. As we were early into our week this was a gentler walk with only a few hundred metres of ascent through some simply stunning country. There are other routes in this area and we could have extended our walk to take in the significantly more challenging Pic Carlit at 2,921m and the magnificent views available from there. However, this walk was a great introduction to this area of the Pyrenees. I lost count of the number of twinkling glacial lakes that we passed, maybe eight? 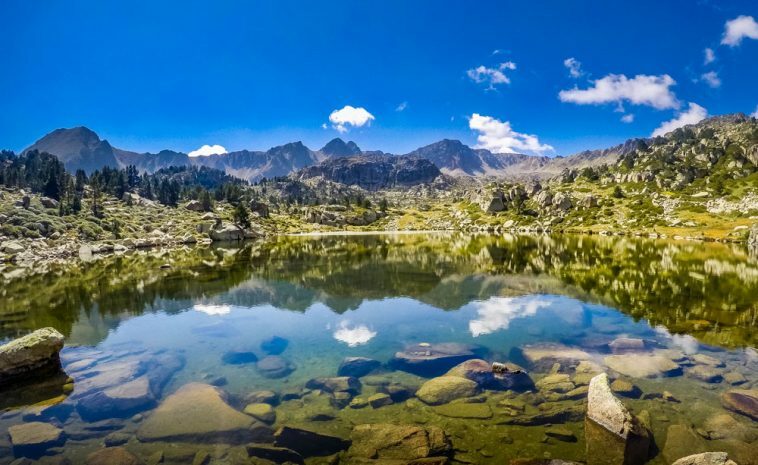 The lakes are such a feature of this area of the Eastern Pyrenees and help make it such a beautiful place to walk in. The hiking was largely straight forward on good paths, and we chewed the fat whilst taking in the constantly beautiful scenery around us whilst enjoying the sun on our backs. It was not a bad way to spend an afternoon. I had read about the Vall de Nuria as part of my pre-trip research (The Pyrenees by Kev Reynolds, a number of the Editorial Alpina maps and guides, and the fabulous rutas pirineos website which has loads of routes that can be downloaded into pdf). Again, the draw here was that machinery would be doing the bulk of our uphill work for us. There is a rack railway track on which trains take visitors from Ribes de Freser or our starting point of Queralbs up 1000 metres of ascent into the Vall de Nuria. 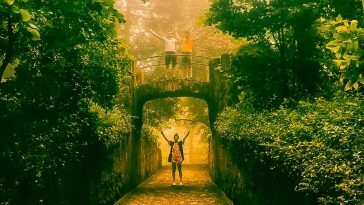 We could have walked the 7km uphill and got the train back down, but I had three sets of middle aged bodies to look after and the noise about our various ailments had already started to increase in both frequency and exaggerated severity. It’s a good job that us northern English folk are so hardy. There are no roads into Nuria so the only way in is by rain, foot, or skis in winter. There is a huge Sanctuary up there, a lovely little chapel, restaurants, cafes and some other attractions and it was certainly very busy as we visited on Catalunya’s national day. However, out interest was in the route back down. 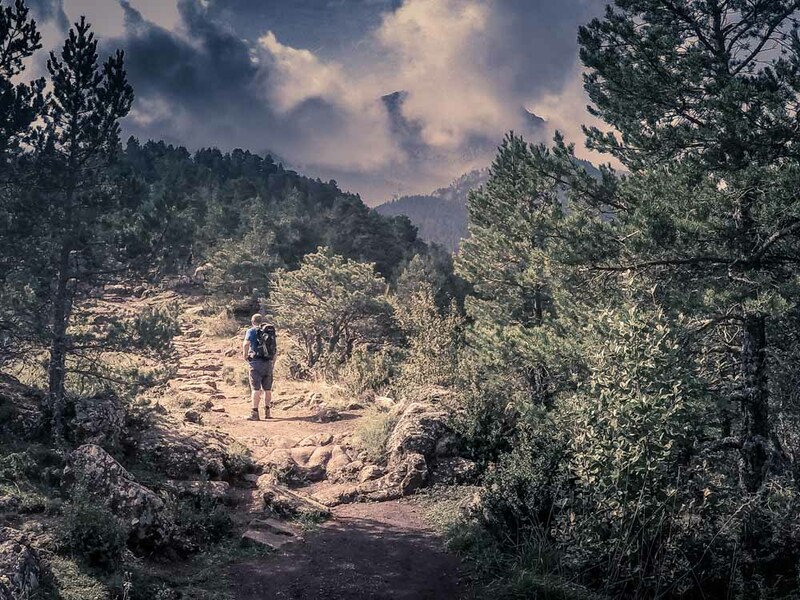 The Camí Vell – the old road – is fabulous path which heads out of Nuria and down the dramatic and steep sided valley that cuts through the mountains on the way back to Queralbs. 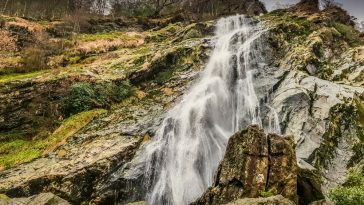 This is a great walk which occasionally crosses the mountain stream that accompanies you downhill before becoming a river and a waterfall as it makes its own way through the valley. This was a very warm day so the occasional shelter of the trees on the way down was welcome. Each we passed the red faced out of breath up-hillers coming the other way provided confirmation that we had chosen our direction of travel wisely. Without doubt the best walk of the week was found in Andorra. 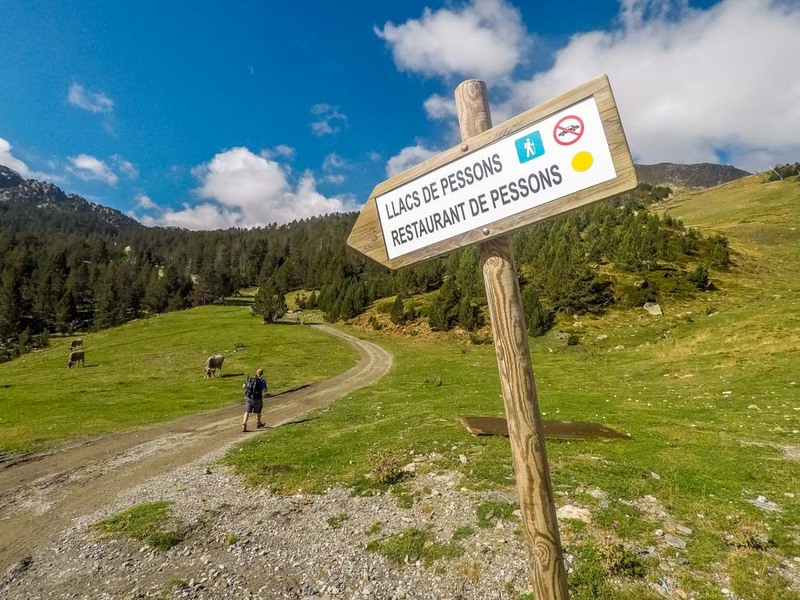 The day began rather un-inspiringly as we drove through dense cloud up steep and winding roads into Andorra and encountered one of the duty-free shop heavy frontier towns at Pas de la Casa. I worried that we may spend the day in the clouds which of course is always a possibility in a country where the average height of a mountain is over 2,000 metres. However, after entering another long tunnel in thick fog we popped out into brilliant sunshine which lifted the mood of all in the car. We parked up at the Grau Roig ski centre before setting off on the Llacs de Pessons circular walk. This was another lake-dotted circular walk through high mountain country on a beautiful sunny day. We soon left the ugly car park behind and passed cows and horses before heading up hill through sweet scented fir forests. We climbed steadily, hopping and scrambling across boulders in the odd section where the land was little steeper, and tiptoed our way across crystal clear streams. We were walking in a huge glacial amphitheatre. Great peaks and ridges surrounded us, and griffon vultures glided on thermals high up above. The high peaks here are attainable but either involved an early start and a long day or as part of longer routes into Encamp to the west. 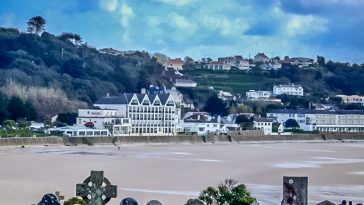 We were enjoying a gentler pace, the warm weather and the stunning views all around us. This really was a magical day and again it was the mountain lakes that were the stars of the shows, creating inverted mirror images of the mountain scenery, aided by the brilliant blue skies above us. There was a sprinkling of other people on the route and we played the guess the nationality game as we passed each group; was it going to be bonjour, bon dia, buenos dias, or hello as we greeted and were greeted by each passer-by. The Catalan/Andorran ‘bon dias’ pipped the ‘bonjours’ on this day. Before the end we stopped at the Pessons restaurant and enjoyed some extraordinarily good coffee on the sun deck, looking out over the lake and contemplated how lucky we were to be in this fabulous spot. 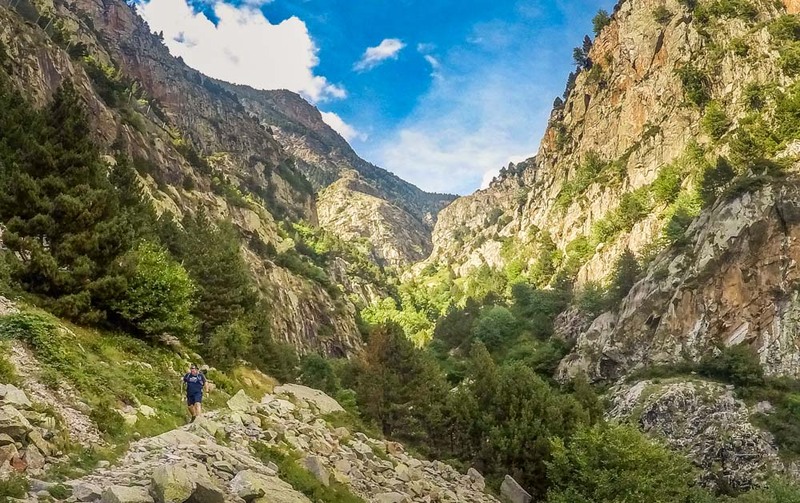 If you ignore the duty-free frontier towns then Andorra is a quite beautiful country and I will be back to discover more. We had the odd day off from walking and enjoyed some other activities in and around Cerdanya. We hired bikes and found some circular routes in the valley, passing through some beautiful countryside and quaint Catalan villages. 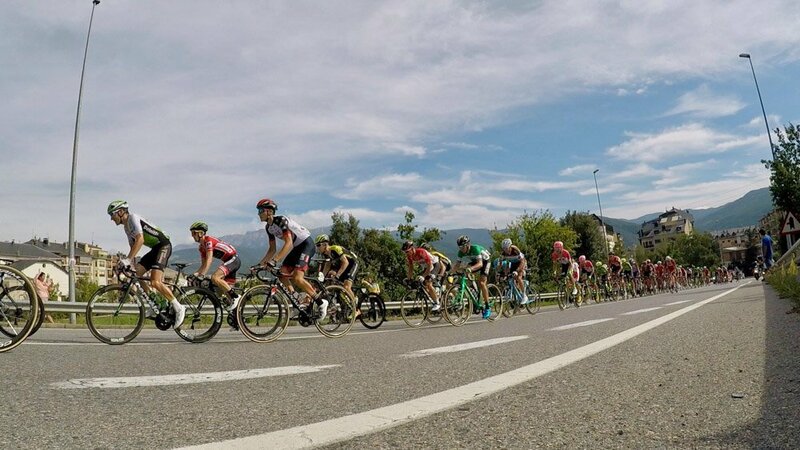 We did some canoeing near La Seu d’Urgell where we also joined the crowds to watch the professional cyclists of the Vuelta a España come speeding through on their way to Andorra. 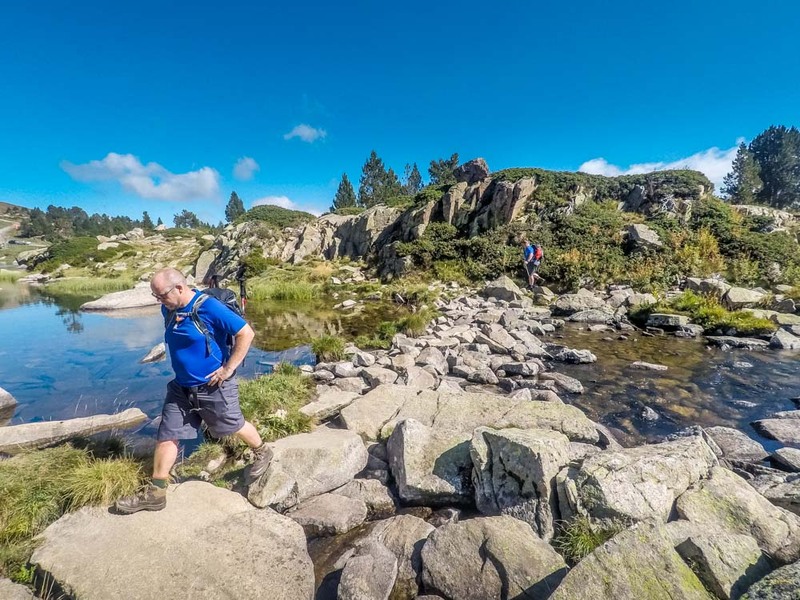 There are lots of other activities to be found in Cerdanya and adjoining regions; canyoning, via ferrata, climbing, horse riding, paddle boarding to name but a few. 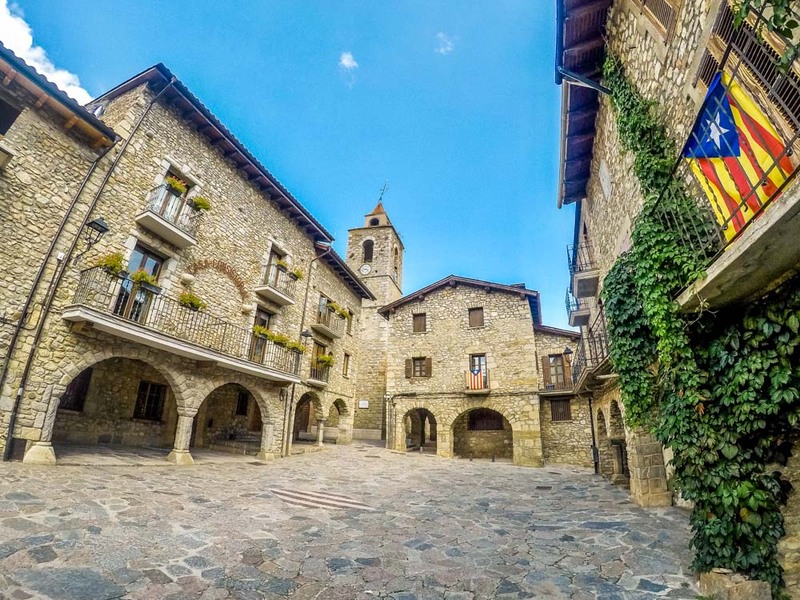 We enjoyed some time in Puigcerdà and visited some of the other towns in the region such as the historic and pretty town of Bellver de Cerdanya. We also sampled the gastronomic speciality of the region, trinxat; a tortilla-like combination of cabbage, potatoes, and bacon which may not sound like your new favourite thing but was delicious. Our final walk was in the Cadí-Moixeró Natural park on a route that took us from the mountain village of Estana to Prat de Cadí; a clearing below the steep walls of the Serra del Cadí peaks. We were walking in mid-September which marks the start of mushroom picking season which is quite a big thing here. All the best restaurants had ‘bolets’ on their menus and examples of them on counters and in restaurant windows. As we walked through red soiled paths through the forests we passed whole families out foraging with their specially made mushroom wicker baskets. The mushrooms were easy to find and abundant, but of course the trick is knowing which ones won’t kill you, so we left the foraging to the experts. 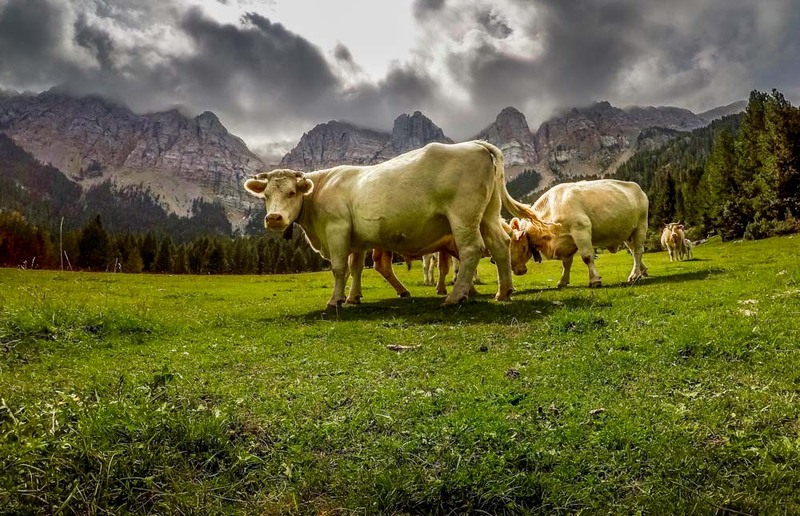 This was another pleasant walk through high altitude forested scenery and the reward was arriving at the clearing at Prat de Cadí and the view of the magnificent limestone cliffs of the Serra del Cadí. We had walked in sun all week – Cerdanya gets over 3000 hours of sunshine each year – so there was a slight disappointment that when we eventually got close to the cliff faces we had been admiring all week that they were capped with clouds, but by then we had been spoiled by the good weather. Out Gore-Tex products had remained unused all week. The clearing was the size of a cricket pitch – it would be a marvellous setting for a game – and we enjoyed our sandwiches, took in the view and contemplated what a beautiful place this was to walk in. We headed back to our car before twisting and turning down narrow mountain roads before finally reaching the main road through the Cerdanya valley. The sun came back out to light up the way home and we enjoyed the views of this mountain lined valley for one last time. 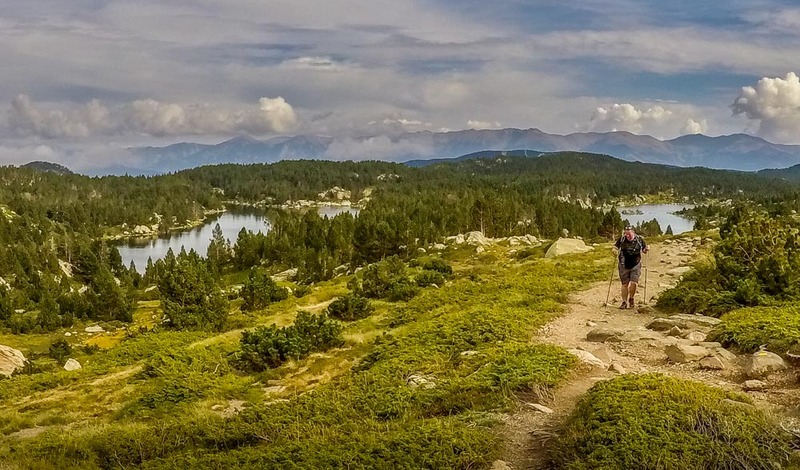 La Cerdanya really is beautiful place and is worth a visit, especially if you love mountains and walking in sunshine.